The title pretty much says it all. The myTouch 3G Fender LE is back in stock! Your local T-Mobile stores should have some in starting today. Act quickly, because stores will be receiving limited quantities and this will be the very last shipment T-Mobile stores will receive. Anyone pick one of these bad boys up yet? Leave your thoughts in the comments! ← The HD2 Needs Your Help! Why would one pick one of those up? It might look pretty and all but it’s got no substance. It would be silly to spend money and sign up for 2 year agreement for thing now. It’s outdated from the start. I wonder whether it will still sell – power of marketing is great though and it often overcomes any sense and reason. Not everyone is looking for the high end “super phone” This device has a good customer base. O, I don’t know. They still want $179 for it. If it was priced at $99 or even below, it just might warrant some attention. They are pricing yesterday’s tech at today’s prices though – there is no excuse for that harsh as it might sound. I mean my 1.5 year old G1 has pretty much the same specs except for less memory. No excuses for TMO and no reason to let them have that much of your money and your 2 year contract more importantly. Sorry if I’m being harsh but Fender just no longer competes with what’s available on other carriers. At this point Nuron is a better buy although that one should really be free. Exactly, if the HD2 level of hardware is priced at $199, then there is really no excuse for asking $179 for the Fender level of hardware at this point. I actually cannot believe that TMO is still asking $199 for TP2 when they’ve priced HD2 at the same exact price. This does not make sense. again green robot not everybody is looking for the greatest phone in the world, actually most people don’t even know what to do with half the power that is already in their smart phones. 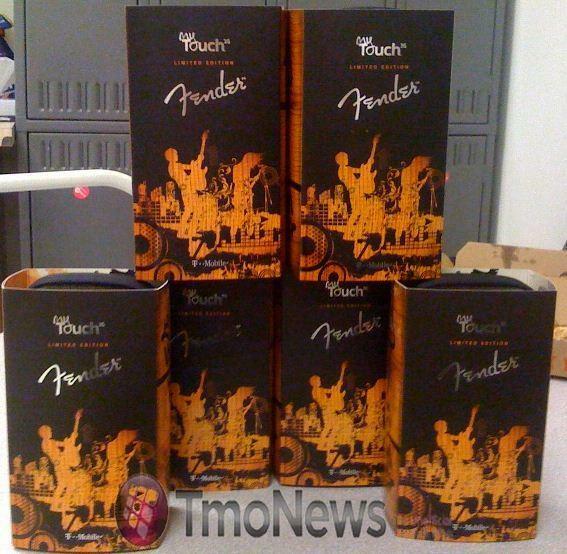 The MyTouch Fender is designed for a customer base that likes a more personalization side of phones, and for about 75% of the people that buy smart phones, the specs that are in the Fender will suite them plenty well enough. Of coarse everbody on these forums will bash the phone for not having the top of the line specs, but believe it or not, we aren’t the average consumer. You would literally have to be on some sort of crack to buy a mytouch in 2010. Unless its coming free with a contract extension, you should either wait for the new android models or pickup the hd2. The behold 2 wouldn’t be bad either [ if and only if you install pandahome from the market]. Greenrobot… you don’t seem to understand the buying public and/or consumer. Very few people go through the kind of analysis you suggest when buying products. Fact is there’s lots of people who want this phone simply because of its coolness factor to them. The fact that YOU don’t like the phone or think it is an outdated POS does not matter to them. They could just as well call you a loser for still using an outdated G1. Carried to the extreme, you should be over at the jewelry store telling customers how stupid they are for spending $15,000 for a Rolex; after all, you preach to them, a Rolex is not the most accurate way to tell time and they don’t need a Rolex to tell what time it is. Tell them to look at their Fender myTouch phones to determine the time. I don’t have a problem with TMO selling mid-level devices. What I do have a problem with is them asking 90% of the price of their top of the line device for that mid-level device. Not everybody wants a $30k Acura TSX and there are plenty of people that will be perfectly happy with a Civic. But then again, Honda is not asking $27K, which would be 90% of the Acura TSX’s price, for that Civic, are they? I’ll see you pay $27K for a Civic and I’ll call you a sucker, and by the same token, I’ll see you pay $179 for myTouch Fender and I’ll call you a sucker as well. No cool paint job is worth that kind of premium. See my point…? i agree with michael not mike even thou the fendor isnt my cup of tea the consumer will buy do to the fact that it is an exclusive and not everyone and there mothers is going to be running around with a fendor bcuz its so limited… people like being different and dont want to jump on the same bus as every one else..
man enough i just want to know whats the next android phone coming out so i can give my bold to my sis or something anyone knows anything???? green robot you talk alot of smack to be using a crappy G1 and more than likely is cuz u cant afford anything else… & u talk like you own phones on every single carrier…. last time i checked all the other carriers attach a $100 MIR to their phones making them more expensive to the consumer at the point of purchase….why dont u go complain about that? droid has $100 MIR sprints BB’s have MIR etc… im not a fan of the mytouch but its still a decent phone and has done really well for tmo ever since its launch… get this through ur head, PHONES are not free! FYI tmo takes a loss even when selling the HD2 at full retail…. why dont u just walk into a nike store and tell em air force ones should be $10 because theyre outdated in your opinion…. see how foolish u sound? I actually returned my HD2 Friday and picked up a MT3G LE. Already had a great experience with the original MT3G. The HD2 kept freezing on me. I was a WinMo user for years and was willing to give 6.5 a try with Sense. Sorry to say, I still had deal with WinMo issues on the beautiful beast. Bottom line, after using WinMo for years starting with the 6315, SDA, MDA, and lastly the HD2, I’m done with the Windows Phones altogether. I’ve done the iPhone 3G also and Android is the way to go for me personally. Only issue with the LE is it’s hard to root. From a retailer point of view, the Fender was great. They were selling at much higher than MSRP and customer’s didn’t care. The Fender is much more than the sum of its parts. Can I use the T-Mobile $10 data plan on my Touch 3g? I so want this phone!